HelpHound Blog: Which business is going to be first to be fined by the CMA? Which business is going to be first to be fined by the CMA? 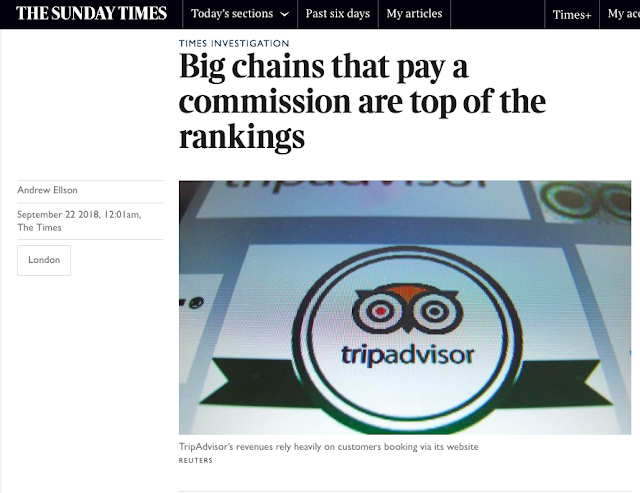 This weekend it was Tripadvisor in the news - but the Times story was not news to us, so it shouldn't be news for the regulators. So why are the reviews sites - almost all reviews sites - still being allowed to mislead consumers? We want a nice hotel - according to the TImes we are being misled into booking one that pays the most commission to the booking website. How is it that online travel agents are still allowed to run ads like this? Show us that the very same room on exactly the same date was priced at $109 on one site and $209 on another and we'll retract this comment. 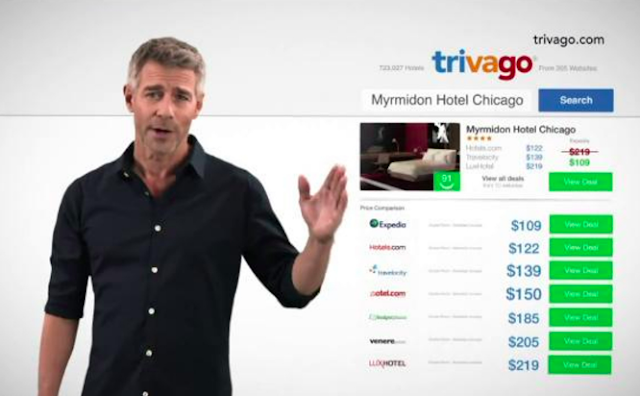 The Trivago ad that runs on most TV channels is a serial offender, misleading viewers into thinking there is a huge price spread for any given hotel room, when any industry insider will tell you that all the booking/reviews sites ensure there's no spread at all by constantly mystery shopping hotels. Yes, the room prices change, depending on all kinds of factors, but one of those factors is not the booking engine (except for tiny exchange-rate differentials). Goodness - some reviews sites even have written into their T&Cs that they will drop hotels that undercut their rate for customers who book direct. And just how many hotel guests are aware that the booking site is being paid a commission, and not just a small commission - 3% - 5% - 8%, but far more commission than the hotel is likely to make in profit from the booking - commonly between 15 and 30 per cent? And that's called 'adding value'? More like highway robbery - of both hotel and guest. Want a great estate agent? You stand a good chance of being channelled towards one that uses a flawed reviews mechanism to enhance its reputation. Perhaps because they are going to be using a Google partner. Google partners, for those still in the dark, are advertising agencies - reviews sites in the context of this article - that have partnered with Google to show star ratings in Google ads - the reviews site wins, because it can 'sell' the ability to show those stars, Google wins, because the business has to pay for an ad to get the stars to show. Nothing wrong with any of that, unless - as we said earlier - the reviews system itself is flawed, which it so often is these days. Buying a product or service online? How about a reviews system that only allows customers chosen by the business to write a review when - and if - the business decides? Shoes collapse after six months and you want to write a review then? No chance. Estate agent has not arranged for your smoke alarm to be mended in spite of repeated requests? In your dreams. You can see the superficial attractions of systems such as these for sloppy businesses: but do they really think that using such a system won't eventually be rumbled by consumers, maybe with a little help from a savvy competitor? And the regulator? 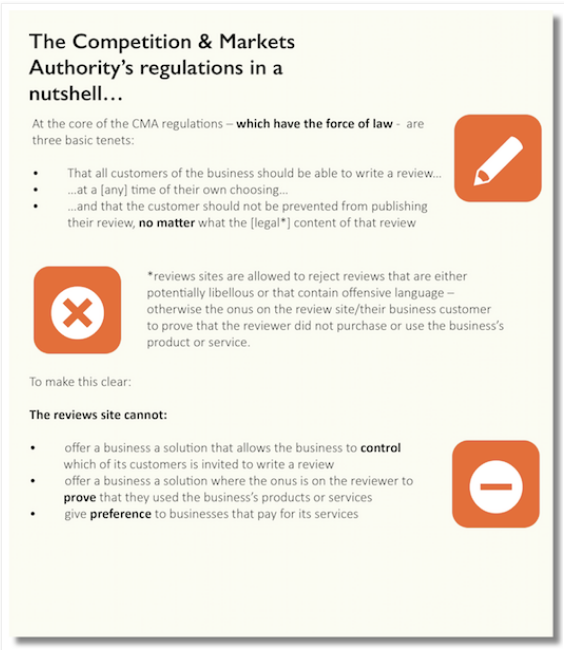 The CMA fined three estate agents £375,000 for colluding over fees, what makes businesses that flout their regulations think they won't do the same over reviews? If, reading this, you can sense anger behind the words you would be right. We are angry, corporately angry, because HelpHound gets tainted by association with these practices. More and more we are asked if we are 'just like all the others - just there to make the business look better, irrespective of whether or not they are actually any good at what they do'? So we are appealing to the government regulator - the Competition and Markets Authority - to address these practices before the whole reviews industry loses the remnants of whatever reputation remains. We spoke to them today and have invited them to comment on the allegations made in the Times article, and any other comments relating to reviews and reviews sites in general. As soon as we have their reply we will publish it here. Check that whatever reviews gathering system you are currently using is compliant with the CMA regulations. There is an easy to follow guide here - or you can simply contact us and we will tell you. It is very important that you understand that the legal onus is on you - the business - to comply with the CMA regulations. You cannot blame the reviews solution you are using and, as is usual in cases like these, ignorance of the law is no defence. "How likely is our business to be fined?" If the business in question has been using a visibly non-compliant mechanism - displayed on their website or referred to in emails - see points 1 - 3 under 'Three of the CMA's core rules' below. This makes the regulator's job a whole lot easier. a member of staff has told us! If we had a pound for every time we met a business and they said 'We didn't know...' (most often referring to cherry-picking) we would be very well off indeed. Non-compliance often leaves a paper-trail that is highly visible (emails asking selected customers to write a review, for example). In these - frequent - cases our advice is to stop whatever non-compliant activity is current immediately and adopt a compliant review management policy as soon as possible. Regulators take a dim view of non-compliance, but an even dimmer view of knowing non-compliance. Three of the CMA's core rules..
1. If the system you are using gives you any advantage whatsoever over the reviewer - challenging negative reviews is an obvious one - then the system you are using is non-compliant. 2. If the system you are using - in-house or contracted out to a reviews site - allows you to select which customers you invite to write a review it is non-compliant. This includes selecting customers to write a Google review. 3. If the system you are using locks consumers out - so they cannot write a review at a time of their own choosing - then the system you are using is non-compliant. The CMA regulations and our analysis: in ten minutes you will know for certain whether your business is compliant or not. 'Two out of three UK businesses are breaking the law': see if yours is one of them. Anyone who has any remaining doubts as to whether or not a good Google score matters should read 'Back to basics - is your Google score hurting your business? '.